Orlandi Gear has always been customer driven. Our floor plan utilizes lean cells which meet or exceed customer demands. Round the clock operations assist us in delivering components in two weeks or less. Our well cross-trained staff complements up-to-date equipment to achieve the high quality standards our customers have come to rely on. We offer competitive pricing on the complete manufacturing of gears, shafts and couplings for the Construction, Aerospace, Hydraulic, Power Take-Off, and Marine Industries. 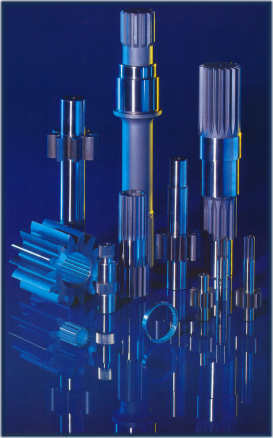 Orlandi Gear began operations in 1944 and has evolved into a prominent gear, spline, keyed shaft, and coupling manufacturing plant. Serving a diverse, worldwide base of industry, our continuous improvement is focused on exceptional products, methods, personnel, facilities and equipment. Our goal is threefold: consistent quality, zero discrepancies and the finest service to our customers. Our business is dedicated to providing superior products and services to our customers. We believe our customers are the most important part of our business now and in the future. We are committed to cutting-edge technology and full implementation of lean manufacturing techniques. These techniques are utilized by highly skilled employees, coupled with our commitment to continuous improvement as evidenced by our ISO Certification, allows us to turn increased productivity into better products at better prices.